Dahlia’s thrive in long summer days, requiring full sun to flower. 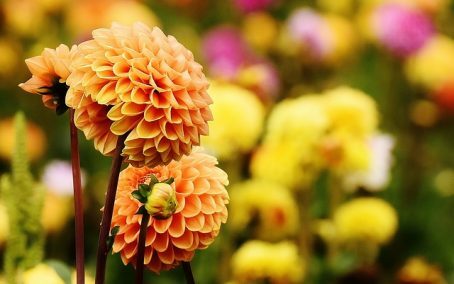 Dahlia’s have beautiful, intricate flower heads and are available in a wide variety of colourful blooms. Lavender, beautifully scented flowers that are a vibrant purple in colour. These strong scented flowers provide the perfect backdrop to an English summer. Hydrangea’s are some of the most beautiful flowers. Available in vibrant colours with distinct clusters of flowers making up a larger flower head. A single Hydrangea plant will often provide multiple colours of bloom. Oriental Lilies are highly fragrant and come in a range of colourful varieties. The colour and markings of Oriental Lilies are very unique. They typically flower in summer between August and September.